Departing by open-top bus, your Frankfurt city tour will take you to the Romer town hall. Constructed in the 15th century, the Romer is Frankfurt's most important historic building, taking its name from Roman settlements that existed there long before Frankfurt itself was founded. At the Romer, you'll depart your tour bus to enjoy a leisurely walk around the historic heart of the city. Be sure to bring your camera to capture sights of architecturally stunning buildings such as St Paul's Church and Frankfurt Cathedral (Gotischer Kirchturm). The tour will then continue to Old Sachsenhausen, a pedestrianized district of Frankfurt famed for its lively cafés, bars and restaurants. Back onboard your open-top bus, you'll travel in comfort to Frankfurt's modern European banking center, where you'll see the tall skyscrapers that characterize the city's imposing skyline. En route to the banking quarter, you'll pass Goethe House, the former home of Johann Wolfgang Von Goethe, an 18th-century literary genius and German poet. 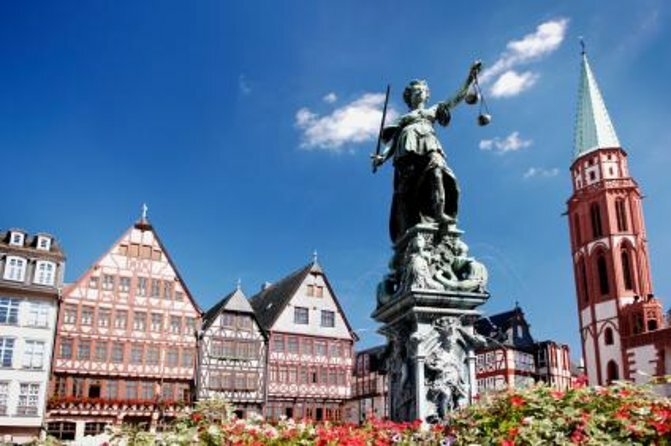 Other top Frankfurt attractions that you'll see before your two-hour guided tour ends include the old Hauptwache Plaza, with its beautiful Baroque buildings, and the famous Zeil shopping center.